So, I finally got around to looking through the Daily Pilot for October 31st about 2 a.m. on November 1st. As I flipped the pages - I LOVE reading a newspaper - a little ad caught my eye. It was below the fold on page B3, beside a quarter page ad for Lobsterfest'14 and above an eighth page ad by the Daily Pilot to "Promote your event with our online calendar". Keep up the commentary, Geoff -- fast and furious. I'm in Ojai today, visiting a cousin. Deb and I have already voted, since we'll be traveling on the 4th. But we'll be perusing the Cauldron from afar, and we both want you to know how much it is appreciated, not only for its exposition of material which would otherwise never see the light, but also for your polite, genteel tone (I would probably never be so nice about something with which I disagree, and some day I will seek your advice on just how you do it!). WOW GEOFF, what a great surprise!! That is really a neat gift. Thank you, to whoever did that. The City is wasting money again! They recently paved the parking lot behind the helipad. Now they are removing the underground fuel tank. Three weeks later? Could have coordinated better, eh? Maybe they should have removed it BEFORE it was beautifully repaved? ANOTHER waste of taxpayers money. What a great gift. But, its fair. If you want to know whats going on, this is the place to find out. Thanks to Costa Mesa First! Many residents participated in this, Geoff. We're very lucky to have you. You're a treasure to our community. You keep us up to date on the goings on in CM, you're the best/truest source of info., and the best watchdog. The DP could learn a thing or two from your reporting! Your diligence has kept us in the loop on many issues and that was money well spent. The community appreciates your long hours spent researching and watching and we thank you. It is well deserved, Geoff. We know where to go to get the truth. Thank you for all your hard work, research and attending almost every meeting and community event in our city. I certainly echo what everyone here said - without you I wouldn't be able to keep up with all that's happening (nor would I be able to send out links to your blog to everyone I know). Thanks, and thanks, too, to the group that put that ad in the Pilot! Comic book hero Superman fights for "Truth, Justice, and the American Way." 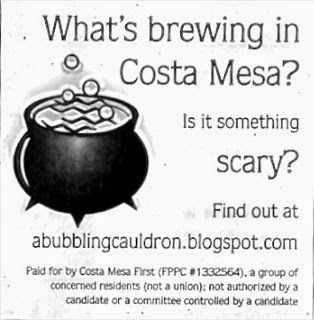 How lucky are we to have a real life person writing a blog who fights for the very same things in Costa Mesa? Love Righeimer's hypocritical comments. The City of Costa Mesa, under Righeimer's watch, hired 2 $130K employees just weeks before the new pension reforms approved by the general city employees went into effect. I guess he means foolish to hire those not his friends at those pensions. Jim Righeimer "But it would be foolish to continue to add employees to pay packages and pension plans that are unsustainable. I do not know any private sector job that gives a pension that is 75% of your highest pay at 55 years of age with a 2% COLA each year." This guy Andrew Smith, should stop LYING. Wasn't this guy on one of those commissions? Now he just lies or did he always lie? Here are the facts regarding the last 2 pension increases. In 2008 our General City Employees received an increase to 2.5 @ 55. There were 3 public council meetings on this issue. That's right 3 PUBLIC COUNCIL MEETINGS. So MR. Smith is just lying saying there were no public hearings. There was also an actuarial report done by CalPers and then looked over by the City' own hired pension expert John Bartell. Incidentally the costs including the retroactive costs estimated were agreed to be paid for by the CMCEA employees. Lastly the item passed 5-0. Extremely conservative Mayor Eric Bever and Council Member Allan Mansoor voted for the enhancement. Mayor Bever after the vote praised CMCEA employees for understanding the the economic impacts and agreeing to pay for the enhancement. Don't believe me check the City Council video archives from May 20, 2008. Mr. Smith just lies saying no hearings and easily influenced councils. 2010 The Fire Employees received an enhancement to 3% @ 50. Also discussed at public council meetings with lot's of discussion. It was nasty at times. Of the 3 votes that passed this 2 of them were conservatives. Monahan and Leece. Both of them agonized greatly over this vote trying to decide the right thing to do. Again you can check the video archives and see Mr. Smith just lies. Andrew Smith's revisionist claims show he is just another disgusting vile individual who just lies to try and trick voters into voting his beliefs. Here is what he said. Andrew Smith "Defined Benefit Plans were fine when we paid for them real time. The trouble came when easily influenced City Councils handed out increases, including retroactive increases, without public hearings and when they had no mechanism to pay for them. We are now a quarter billion in debt in Costa Mesa as a result. Never Again..."
Here is the agenda for VERY PUBLIC HEARING that occurred May 2008 at the PUBLIC CITY COUNCIL MEETING. Mr. Smith of course says no public hearings occurred.